Showing items in category Egypt, sorted by newest listed first. 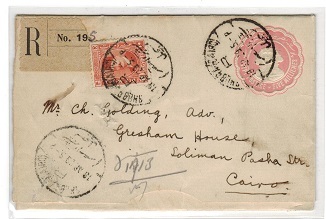 EGYPT - 1895 5m (1d) 'soldiers' rate cover to UK. 1895 (23.X.) 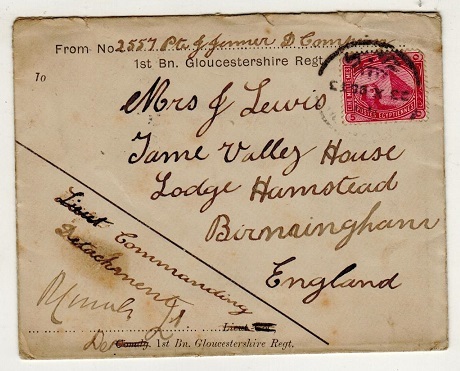 use of pre-printed '1st Bn Gloucestershire Regt' envelope addressed to UK bearing 5m carmine 'Spinx' adhesive. A scarce soldiers 1d rate cover signed at lower left by the Lieutn Col.
EGYPT - 1927 4m IMPERFORATE PLATE PROOF block of four in green struck CANCELLED on reverse. 1927 4m green 'Postage Due' (SG type D59) in a fine IMPERFORATE PLATE PROOF corner marginal block of four with CANCELLED applied diagonally in black on reverse. EGYPT - 1927 2m IMPERFORATE PLATE PROOF block of four in red-orange struck CANCELLED on reverse. 1927 2m red-orange 'Postage Due' (SG type D59) in a fine IMPERFORATE PLATE PROOF corner marginal block of four with CANCELLED applied diagonally in black on reverse. 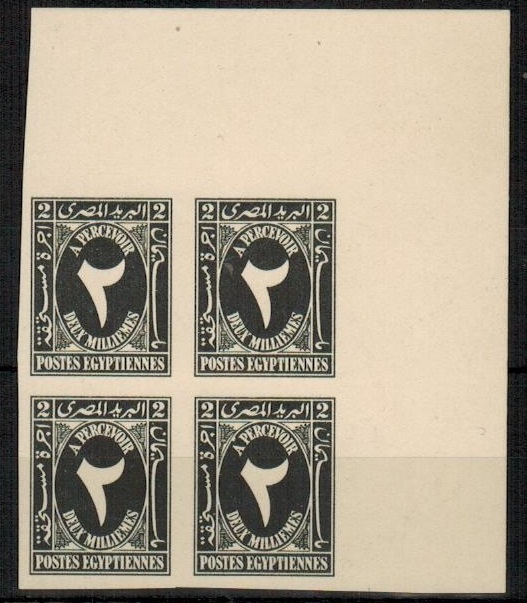 EGYPT - 1927 2m IMPERFORATE PLATE PROOF block of four in grey-black struck CANCELLED on reverse. 1927 2m grey-black 'Postage Due' (SG type D59) in a fine IMPERFORATE PLATE PROOF corner marginal block of four with CANCELLED applied diagonally in black on reverse. EGYPT - 1871 1/- double rate entire to UK bearing GB 6d (plate 9) pair tied 'B 01'. SG Z24. 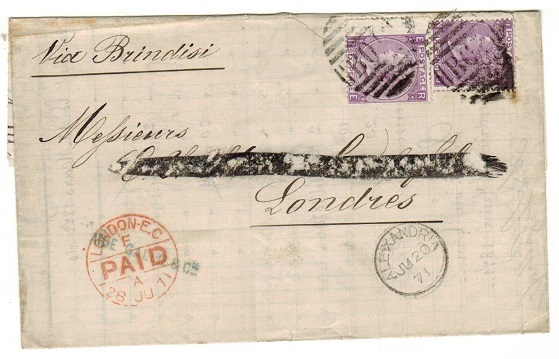 1871 entire addressed to UK (address line blacked out) bearing GB 6d violet adhesive pair (plate 9) paying the double rate to UK cancelled by 'B 01' numerla strike and with ALEXANDRIA cds below. SG Z24. EGYPT (BR.FORCES USED IN) - 1936 3m green rate cover to UK used at MPO/ABU QIR. BRITISH FORCES IN - 1936 (DE.31.) 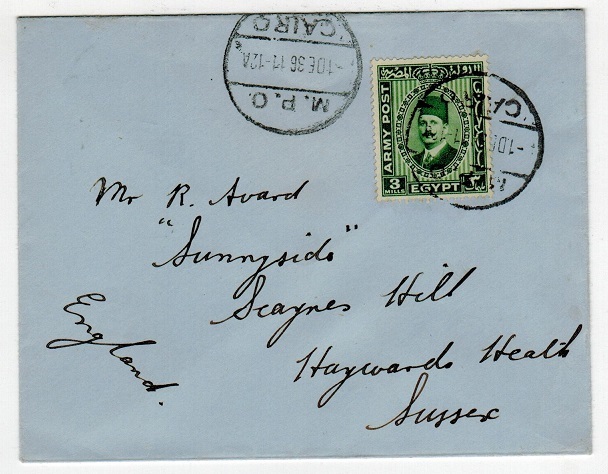 cover addressed to UK bearing 3m green (SG A12) tied by M.P.O./ABU QIR cds. EGYPT - 1881 1p rate local cover used at DESSOUK and struck in 'blue' ink. 1881 (AV.23.) cover addressed locally bearing 1p adhesive tied by DESSOUK cds struck in 'blue' ink. 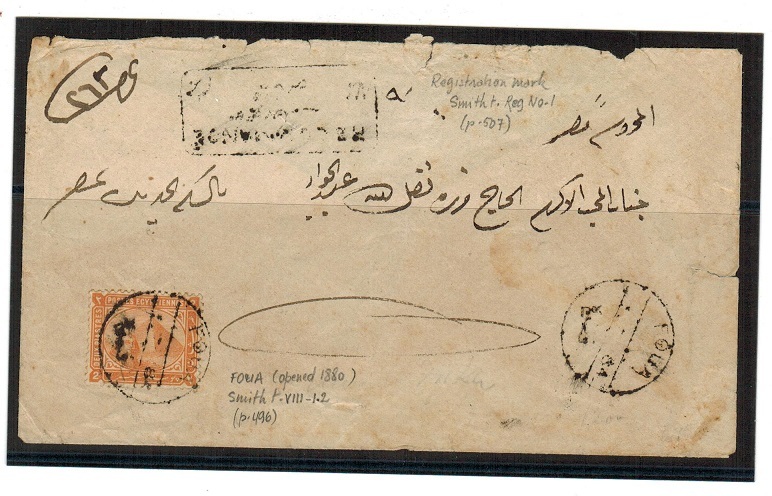 EGYPT - 1882 1p rate local cover used at FOUA. 1882 (JA.13.) miniature cover addressed locally (ex reverse flap) bearing 1p adhesive tied FOUA. EGYPT - 1882 1p rate local cover used at TANTAH/ARRIVEE. 1882 (JA.10.) cover addressed locally bearing 1p adhesive tied TANTAH/ARRIVEE. EGYPT - 1882 1p rate local cover used at TANTAH/DEPART. 1882 (AV.20.) cover addressed locally bearing 1p adhesive tied TANTAH/DEPART. EGYPT - 1884 1p rate local cover used at MINOUF. 1884 (DE.14.) cover addressed locally (ex part of reverse flap) bearing 1p pair adhesive tied MINOUF. 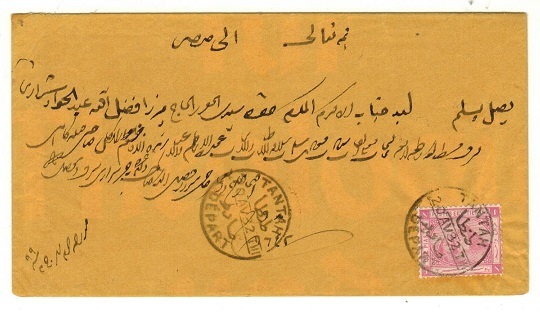 EGYPT - 1887 1p rate local cover used at BENI-MAZAR cds. 1887 (FE.14.) 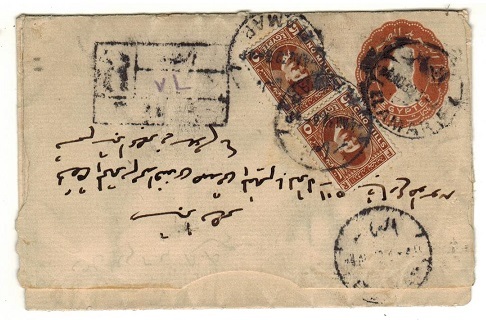 cover addressed locally bearing 1p blue tied by BENI-MAZAR cds. 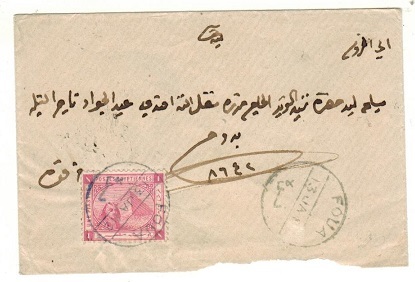 EGYPT - 1891 1p rate local cover used at FOUA and struck in 'blue' ink. 1891 (SE.6.) 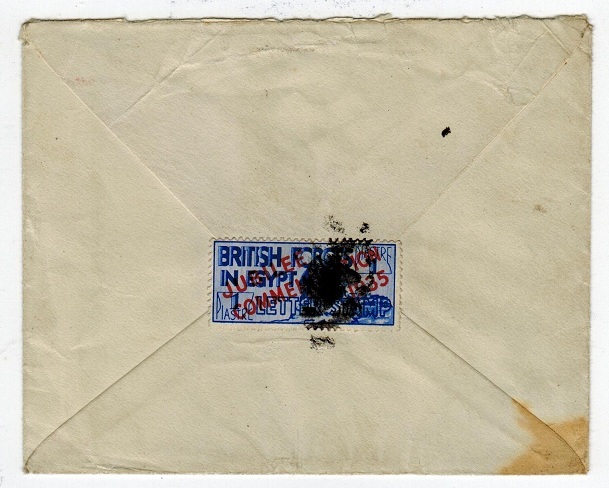 miniature cover addressed locally (ex reverse flap) bearing 1p adhesive tied by FOUA cds struck in 'blue' ink. 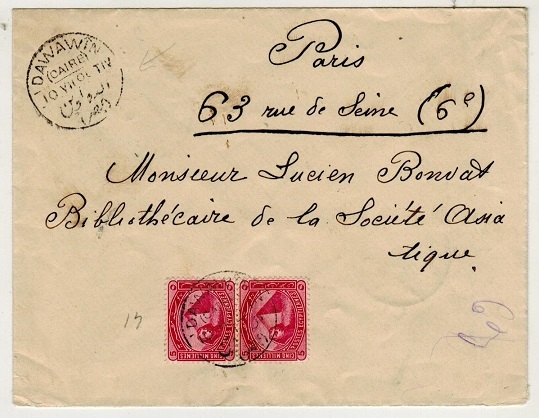 EGYPT - 1868 outer wrapper to France bearing French 80c red tied by '5080' rhomboid. FRENCH OFFICES - 1868 (MAR.29.) 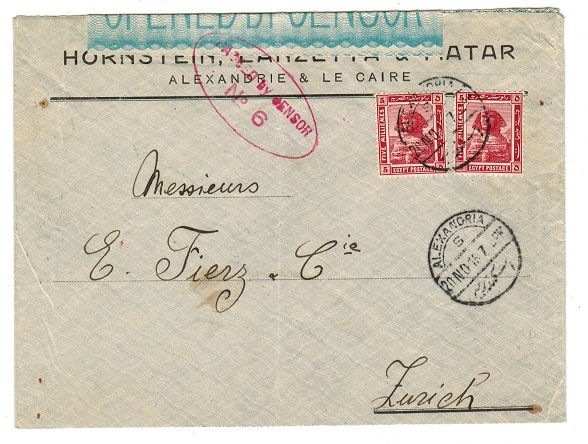 outer wrapper addressed to France bearing French 80c red adhesive tied by dotted '5080' rhomboid cancel used in Egypt with ALEXANDRIE/ EGYPT cds at left. Handstamped 'PD' (Paid) and with F.B.BOUGROGGNE/ALEXANDRIE commercial handstamp at left. 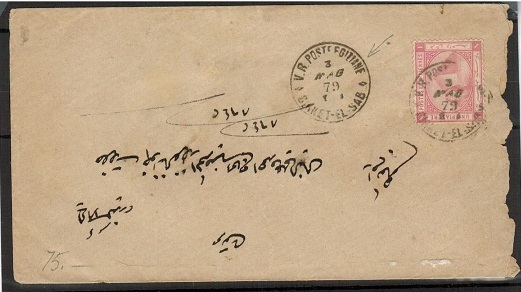 EGYPT - 1879 1p rate cover addressed locally at SINKET EL SAB. 1879 (MAG.3.) 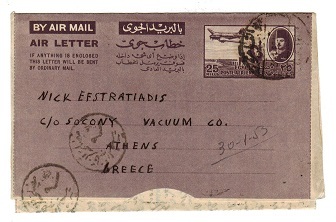 cover addressed locally bearing 1p adhesive tied by scarce V.R.POSTE EGIZIANE/ SINKET EL SAB cds. 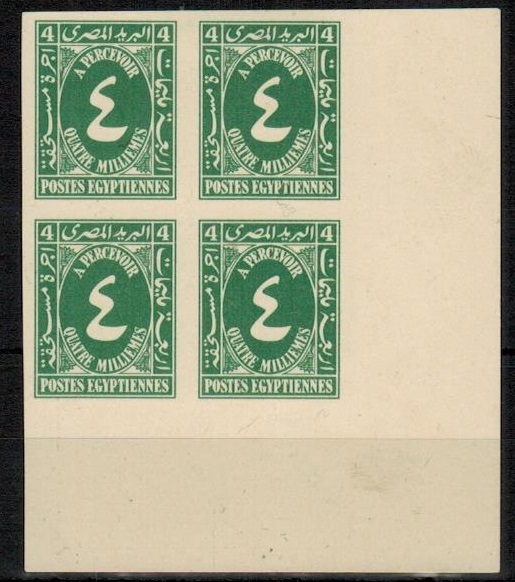 EGYPT - 1914 2m green mint block of 4 with OHMS overprint INVERTED. SG 084b. 1914 2m green in a fine mint block of four overprinted O.H.M.S. and showing the major variety OVERPRINT INVERTED. SG 084b. EGYPT - 1930 5m brown letter sheet uprated locally for registered mail at ELAMAR. H&G 9. 1930 5m light brown on cream postal stationery letter sheet addressed in Arabic with additional 5m brown adhesive pair added. Registered and tied ELAMAR and dated 4.AU.32. H&G 9. 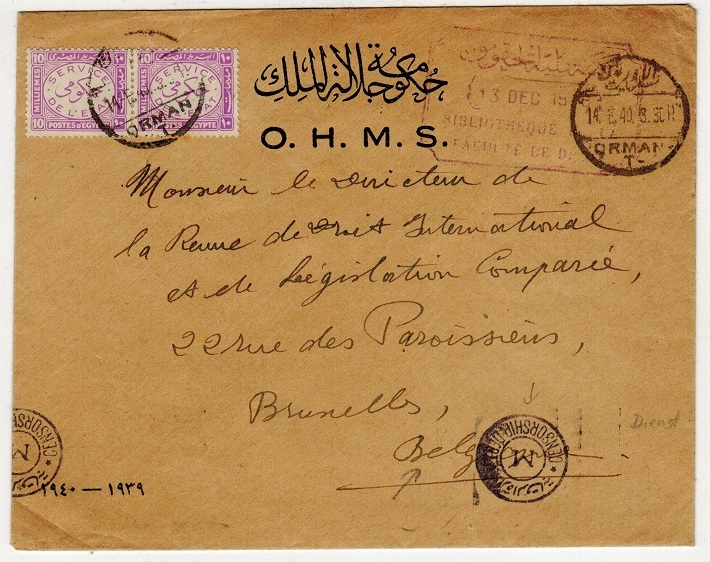 EGYPT - 1940 'OHMS' cover to Belgium with 10m 'Service' pair applied at ORMAN. 1940 (FE.14.) stampless OHMS envelope addressed to belgium with 10m bright violet SERVICE official adhesive pair added and cancelled ORMAN. Black circular M/CENSORSHIP applied. EGYPT - 1938 10m IMPERFORATE PLATE PROOF 'Service' stamp printed in bright violet. 1938 10m SERVICE DE L'ETAT 'Official' IMPERFORATE PLATE PROOF (SG type 085) printed in the issued colour of bright violet on thick white card with Arabic print on reverse side. EGYPT - 1938 2m IMPERFORATE PLATE PROOF 'Service' stamp printed in red. 1938 2m SERVICE DE L'ETAT 'Official' IMPERFORATE PLATE PROOF (SG type 085) printed in the issued colour of red on thick white card with Arabic print on reverse side. EGYPT - 1938 1m IMPERFORATE PLATE PROOF 'Service' stamp printed in orange. 1938 1m SERVICE DE L'ETAT 'Official' IMPERFORATE PLATE PROOF (SG type 085) printed in the issued colour of orange on thick white card with Arabic print on reverse side. 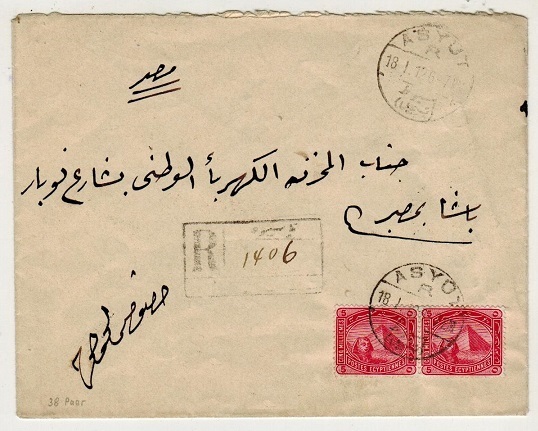 EGYPT - 1915 censored F.P.O./No.311 cover addressed in Arabic. 1915 (OC.6.) 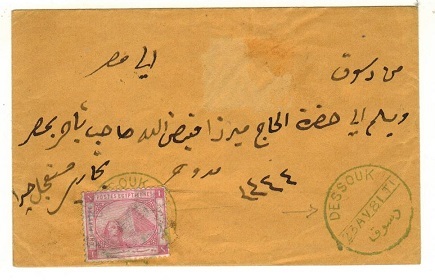 stampless cover addressed in Arabic cancelled on the reverse by F.P.O./No.311 cancel use by Indian troops at Suez hospital and struck on the front by violet circular PASSED BY CENSOR/INDIAN EXPEDITIONARY FORCES/38 handstamp. 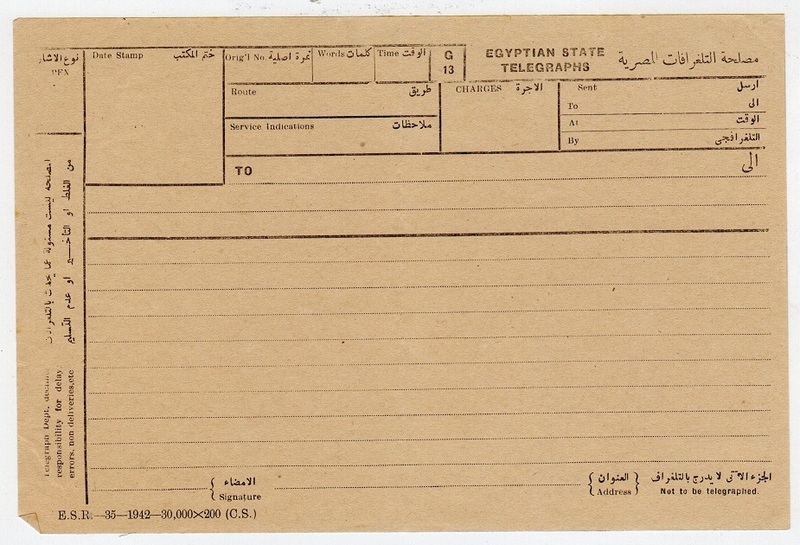 EGYPT - 1921 use of local TELEGRAM complete with telegraph form used at CAIRO. 1921 (APR.7.) 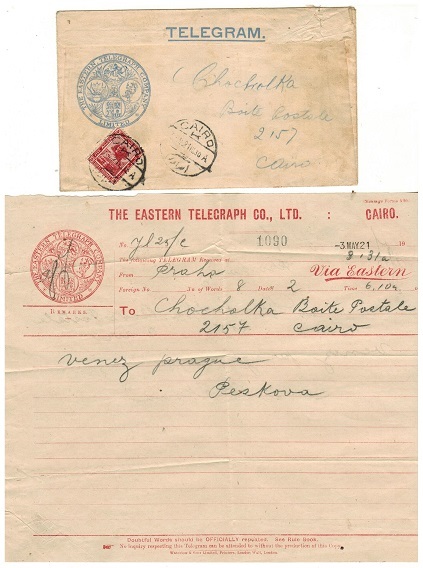 blue on cream 'The Eastern Telegraph Company Limited' TELEGRAM envelope addressed locally bearing 5m adhesive tied CAIRO. Complete with the original red on cream TELEGRAM. (2 items). EGYPT - 1939 3m brown PSC uprated with 2c DIAGONALLY BI-SECTED making up the 4m rate. 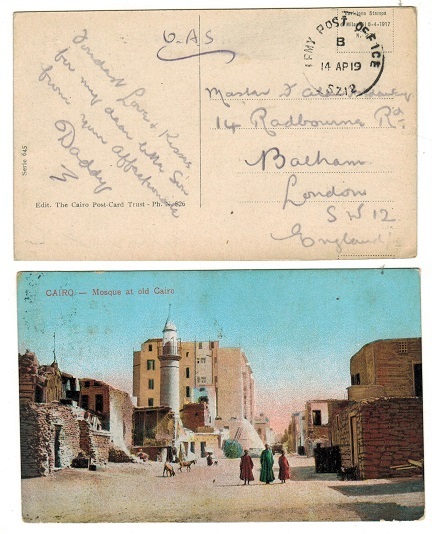 1939 3m brown postal stationery postcard addressed locally and bearing a 2m adhesive DIAGONALLY BI-SECTED and tied alongside by CAIRO cds. A genuine use with message of this bi-sected stamp making up the 4m local rate. Unusual item. H&G 36. EGYPT - 1948 1 1/2d rate 'Forces Mail' cover to UK used at FPO 151. 1948 (JA.10.) 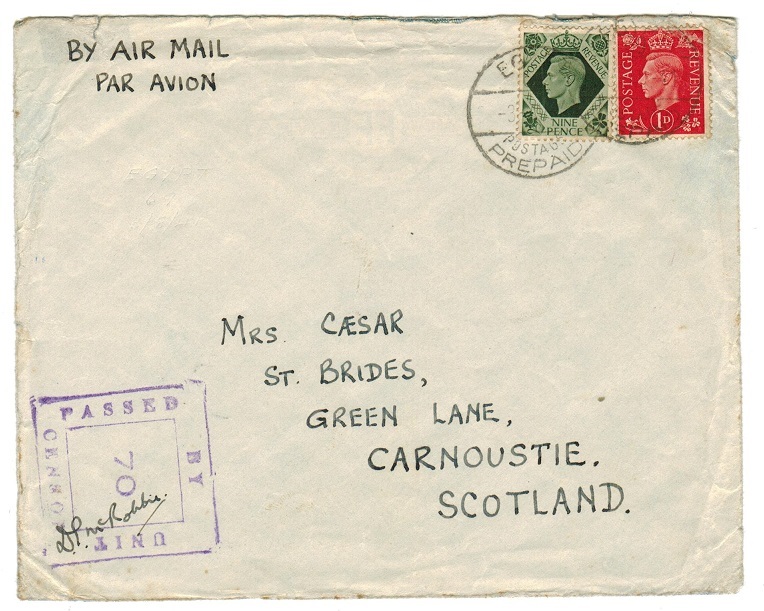 cover addressed to UK marked 'Forces Air Mail' bearing GB (un-overprinted) 1 1/2d adhesive tied by FIELD POST OFFICE/551. Marked origin on reverse as 'HQ RAF at Abu Sueir'. FPO 151 later went to Bahrain. 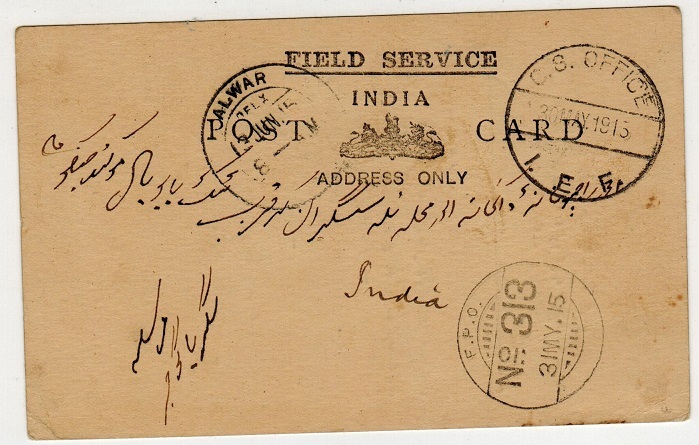 EGYPT - 1915 'FIELD SERVICE' postcard to India used at FPO No.313. 1915 (30.MY.) stampless FIELD SERVICE/INDIA blank type postcard addressed to India pre-printed on reverse in Indian script for use by soldier 'I am fine…. Etc' cancelled by scarce C.S.OFFICE/I.E.F. cds with F.P.O./No.313 cancel below of the following day used by troops stationed at Ismalia. ALWAR arrival. 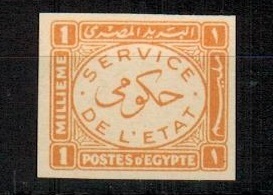 EGYPT - 1912 10m rate registered local cover used at ASYUT. 1912 (18.I.) registered cover addressed locally bearing 5m pair tied ASYUT. EGYPT - 1908 5m rate local cover used at RAS EL TIN. 1908 (15.VII.) cover addressed locally bearing 5m adhesive tied RAS EL TIN. Complete with original letter. EGYPT - 1906 10m rate cover to France used at DAWAWIN. 1906 (10.VII.) 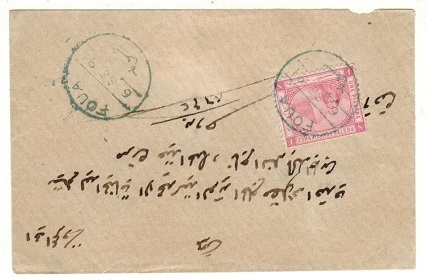 cover addressed to France bearing 5m pair tied DAWAWIN/(CAIRE). EGYPT - 1899 2p local registered cover used at MANOUD. 1899 (AO.19.) 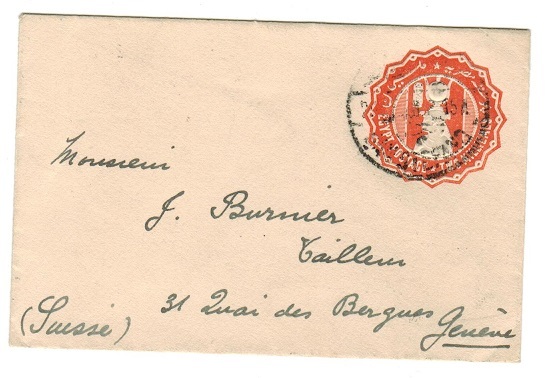 neat locally addressed cover bearing 2p orange tied by MANOUD/CAISSE cds. 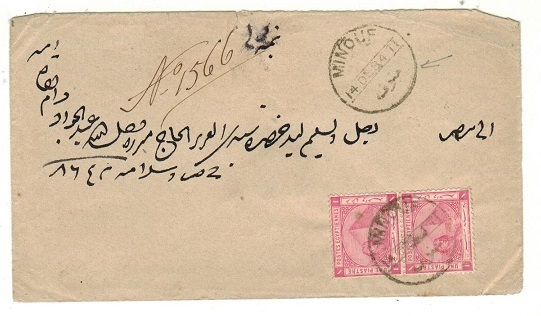 EGYPT - 1898 10m rate cover to Iran used at GHOUHIA/CAIRE. 1898 (30.V.) 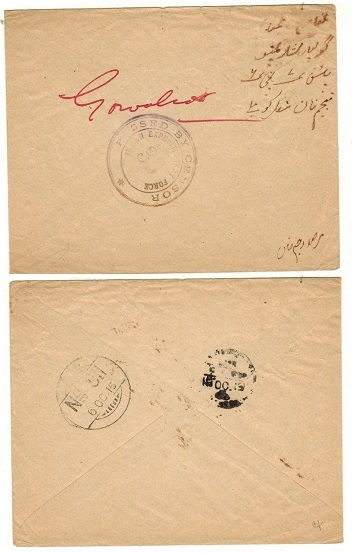 cover addressed to Iran bearing 5m pair on reverse flap tied GHOUHIA/CAIRE. EGYPT - 1929 'S.S.TAIF' maritime cover used from PORT TAUFIQ to ALEXANDRIA. 1929 (SE.11.) 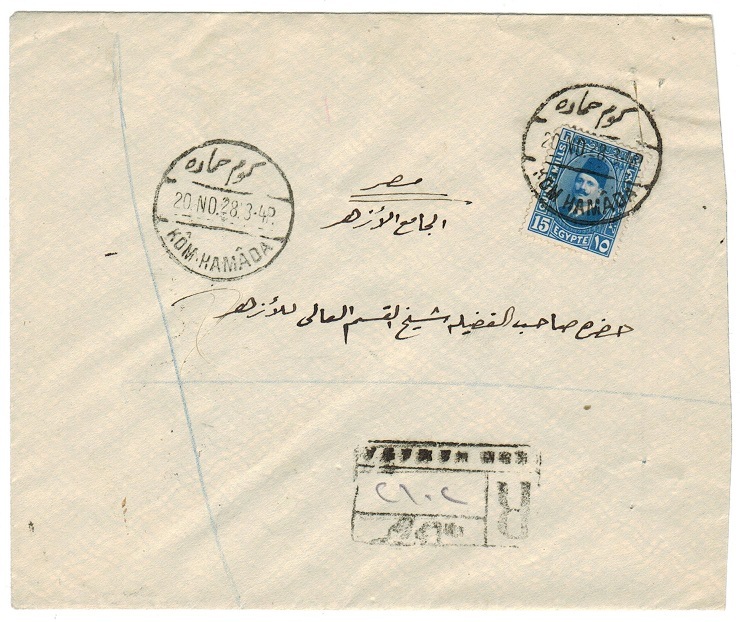 cover addressed to Alexandria bearing 1m and 4m adhesives tied by violet oval S.S.TAIF/KHEDIVIAL MAIL LINE strike with PORT TAUFIQ cds at left. Alexandria arrival b/s. 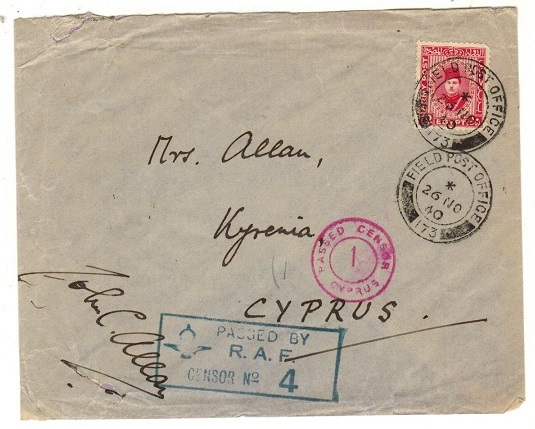 CYPRUS - 1940 inward cover from Egypt with 'PASSED BY CENSOR 1' h/s applied. 1940 (NO.26.) 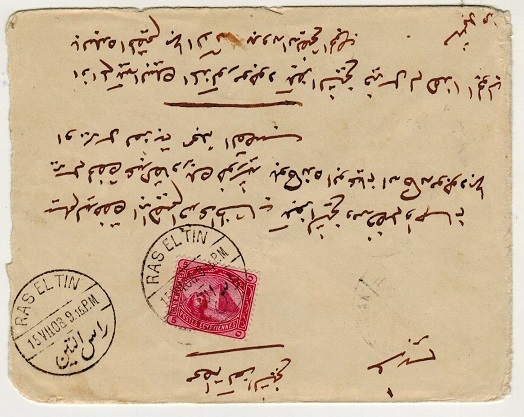 inward cover addressed to Kyrenia bearing British Occupation Of Egypt 10m red adhesive (SG A13) tied by FIELD POST OFFICE/173 cds with blue boxed PASSED BY/ R.A.F./CENSOR 4 handstamp below. NICOSIA transit b/s and KYRENIA arrival with scarce red d/r PASSED CENSOR/1/CYPRUS strike applied to the front. EGYPT - 1918 'O.A.S.' use of censored cover to UK used at ARMY POST OFFICE SZ12. 1918 (NO.26.) 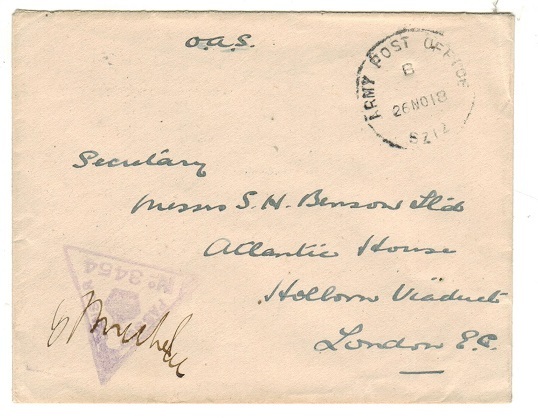 stampless cover addressed to UK marked 'O.A.S.' and cancelled by s/r ARMY POST OFFICE/SZ12 cds used by troops stationed at Alexnder. Violet triangular PASSED BY CENSOR/No.3454 h/s at lower left. EGYPT - 1919 'O.A.S.' use of postcard to UK used at ARMY POST OFFICE SZ12. 1919 (14.APR.) stampless use of postcard addressed to UK marked 'O.A.S.' and cancelled by s/r ARMY POST OFFICE/SZ12 cds used by troops stationed at Alexnder. EGYPT - 1917 use of FIELD SERVICE postcard from ARMY POST OFFICE/SZ9. 1917 (FE.4.) 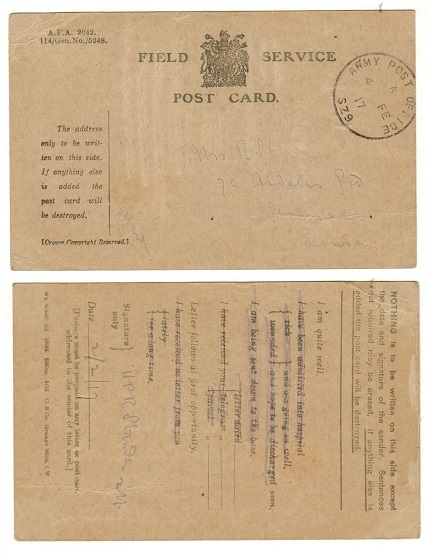 use of FIELD SERVICE postcard (A.F.A.2042) addressed to UK in soldiers pencil stating in pre printed text 'I'm Well' and cancelled by s/r ARMY POST OFFICE/SZ9 cancel used by troops stationed at El Arish in Egypt. 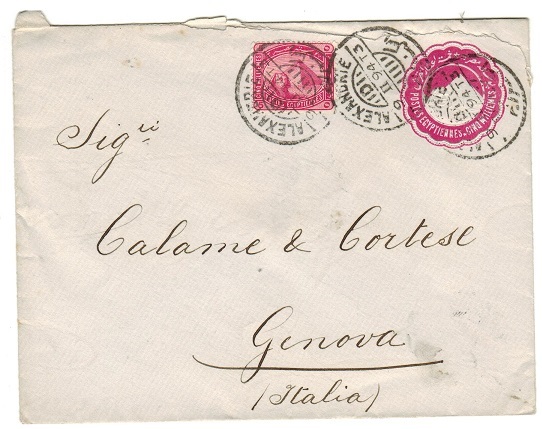 EGYPT - 1889 5m carmine PSE to Italy used at ALEXANDER. H&G 6. 1889 5m carmine on bluish grey postal stationery envelope addressed to Italy bearing additional 5m adhesive & cancelled ALEXANDRIE/D cds dated 9.II.94. H&G 6. EGYPT - 1889 2p orange underpaid PSE to Italy used at ALEXANDER. H&G 3. 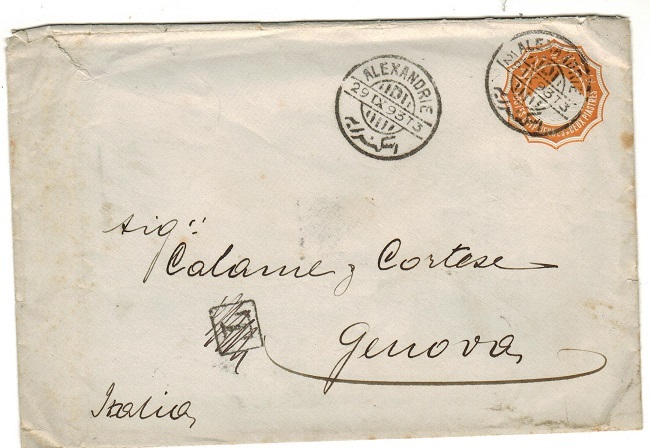 1889 2p Orange on bluish grey postal stationery envelope addressed to Italy & cancelled ALEXANDRIE/D & dated 29.IX.93. Boxed 'T' tax mark manuscriptly cancelled at bottom. H&G 3. EGYPT - 1889 1p ultramarine PSE to Italy used at ALEXANDER. H&G 2. 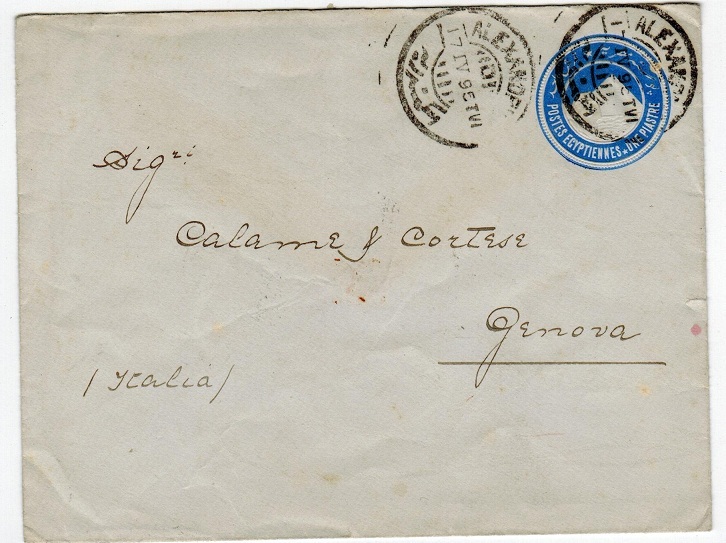 1889 1p Ultramarine on bluish grey postal stationery envelope addressed to Italy & cancelled ALEXANDER/D cds dated 16.II.95. H&G 2. EGYPT - 1889 2m green PSE to Switzerland used at SMALL. H&G 5. 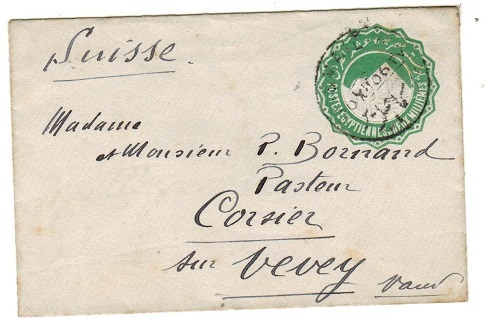 1889 2m green postal stationery envelope (type d) addressed to Switzerland & cancelled by SMALL cds dated 20.XII.06. H&G 5. EGYPT - 1941 FPO/190 censor cover to India. 1941 (MR.13.) 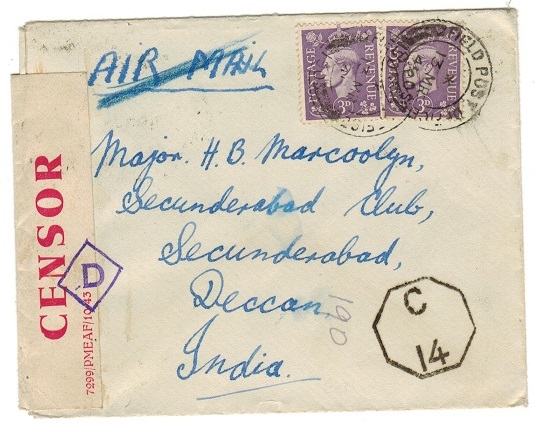 cover addressed to India bearing 'GB' 3d (x2) tied by FIELD POST OFFICE/190 cds with scarce PC.22/OPENED BY/CENSOR label at left edge with '7299/PMEAF/10-43' imprint tied by violet diamond shaped 'D' censor strike. British troops located at Cairo GHQ. 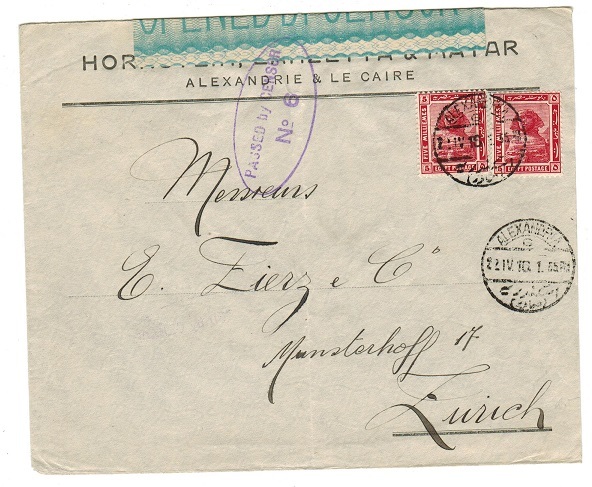 EGYPT (French Offices) - 1873 80c rate local outer wrapper cancelled '5080' at ALEXANDRIE. 1873 (AOUT.18.) 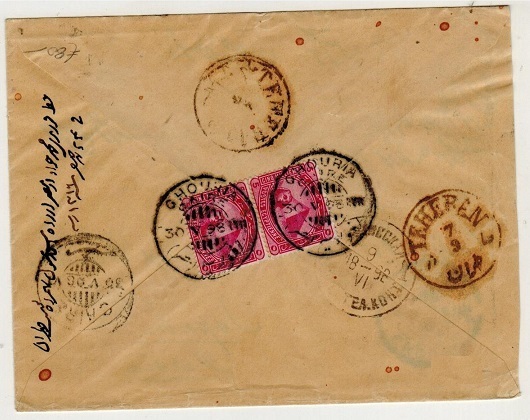 outer wrapper addressed locally bearing French 80c red adhesive tied by dotted '5080' rhomboid cancel used in Egypt with ALEXANDRIE/EGYPT cds at left. Handstamped 'PD' (Paid) and with F.B.BOUGROGGNE/ALEXANDRIE commercial handstamp at left. 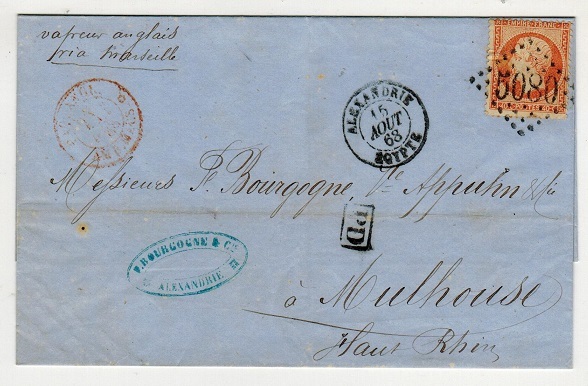 EGYPT (French Offices) - 1868 40c rate local outer wrapper cancelled '5080' at ALEXANDRIE. 1868 (AOUT.15.) 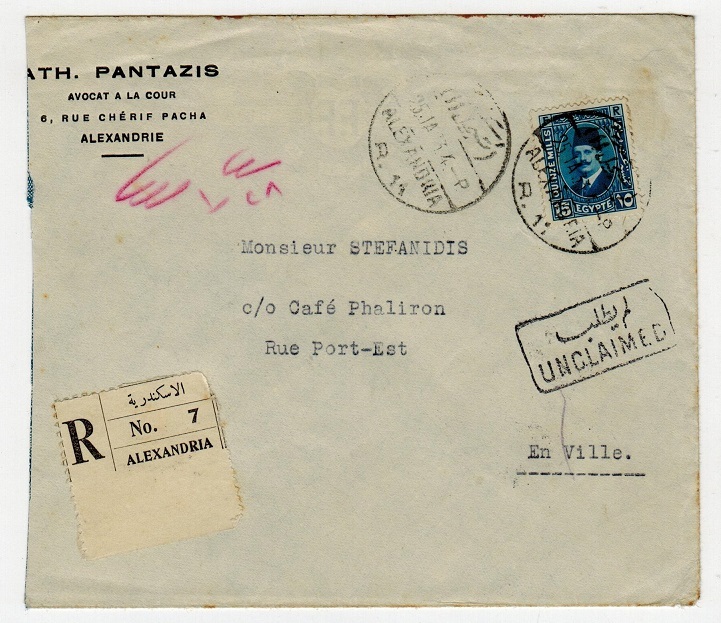 outer wrapper addressed locally bearing French 40c orange adhesive tied by dotted '5080' rhomboid cancel used in Egypt with ALEXANDRIE/EGYPT cds at left. 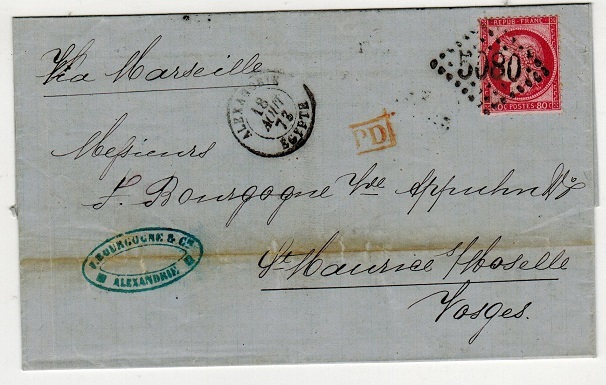 Handstamped 'PD' (Paid) and with F.B.BOUGROGGNE/ALEXANDRIE commercial handstamp at left. EGYPT - 1945 'Prisoner Of War' letter sheet to Italy. 1945 (AUG.8.) 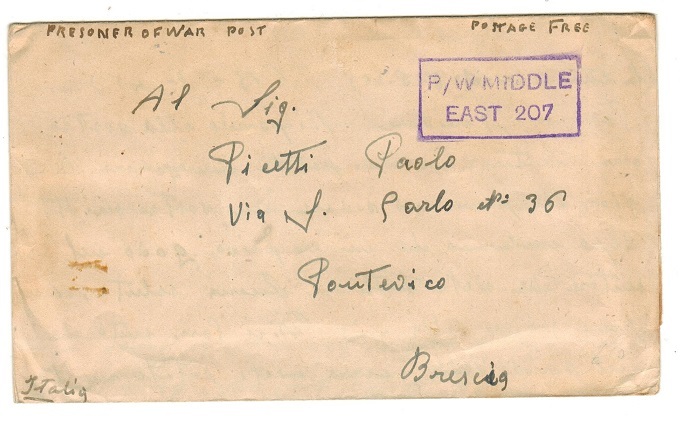 'Prisoner Of War' letter sheet with tuck in flap on reverse addressed to Italy from an Italian internee and struck by violet boxed P/W MIDDLE/EAST 207 h/s. Sent from POW 308 Camp. EGYPT - 1945 inward 'Italian Red Cross' cover to prisoner of war at 310 camp. 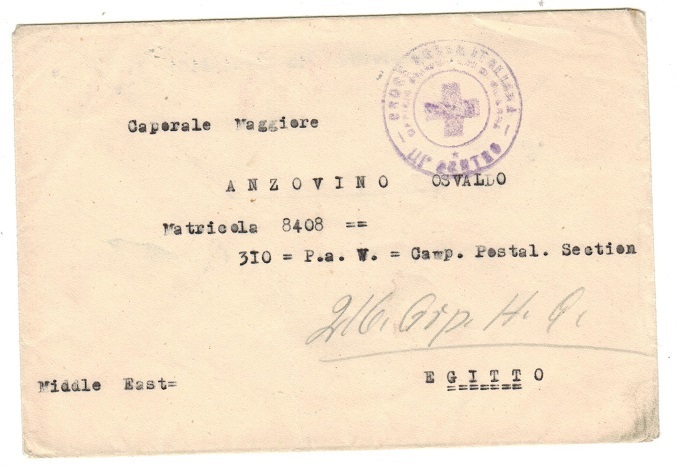 1945 inward stampless cover from Italy addressed to the POW camp 310 in Egypt and struck by violet ITALIAN RED CROSS strike. Sent to an Italian internee and complete with original letter. 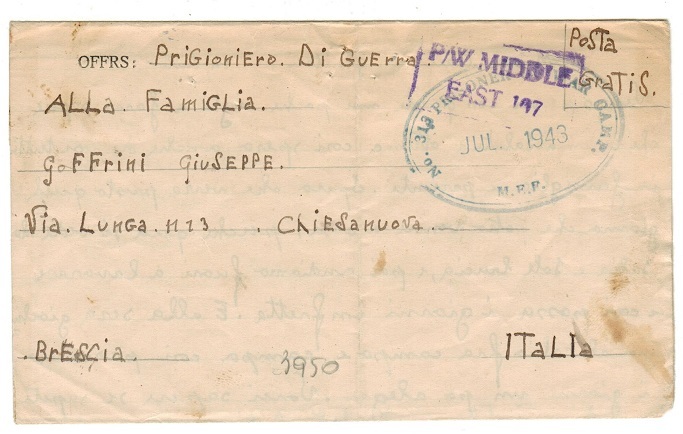 EGYPT - 1943 'Prisoner Of War' letter sheet to Italy. 1943 (JUL.) 'Prisoner Of War' letter sheet with tuck in flap on reverse addressed to Italy from an Italian internee and struck by blue oval NO. 313 PRISONER OF WAR CAMP/MEF strike with violet boxed P/W/MIDDLE/EAST 107 h/s. EGYPT - 1929 15m RPSE used locally and uprated at ALEXANDRIA. H&G 4. 1929 15m Dark blue on cream registered stationery envelope used locally and bearing additional 5m+15m adhesives tied ALEXANDRIA and dated 7.DE.35. H&G 4. 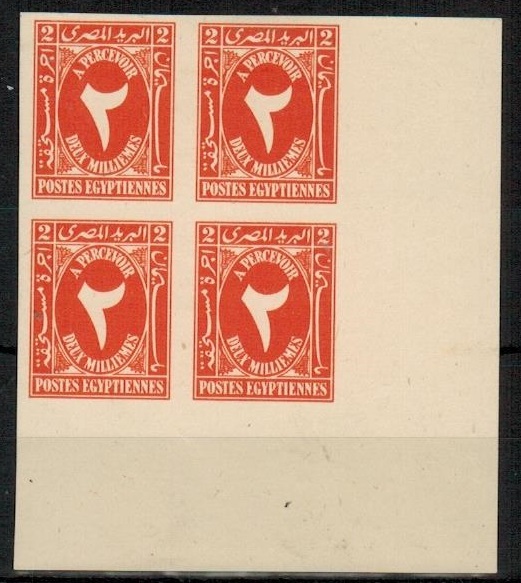 EGYPT - 1880 red on cream range of INTERPOSTAL SEALS. 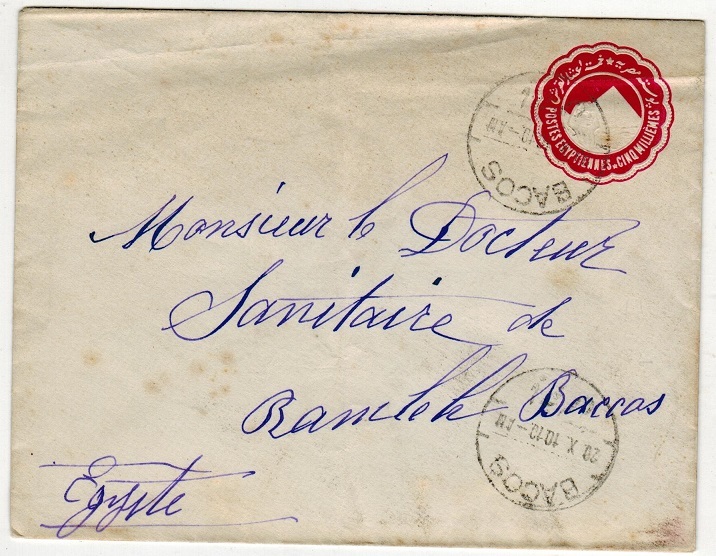 1880 (circa) red on cream INTERPOSTAL SEALS for BEDRECHEIN, ROSETTE and SIDI GABER. 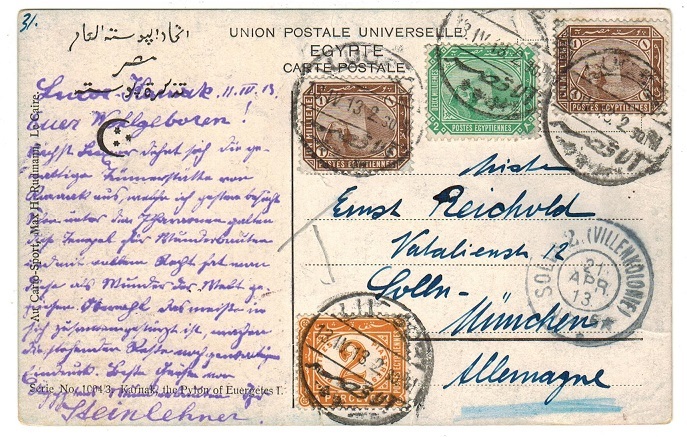 EGYPT - 1913 10m blue RPSE uprated to Germany and used at EL EBRAHIM/SWARDIA. H&G 2. 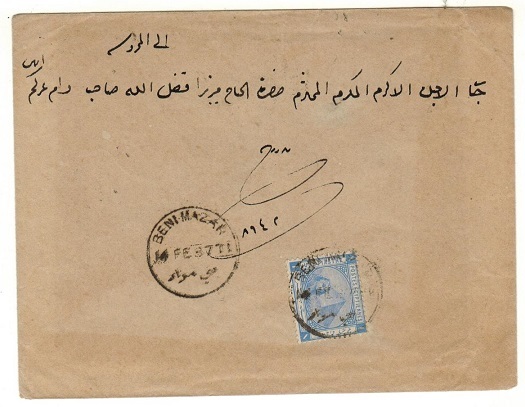 1913 10m blue on cream registered postal stationery envelope with Arabic text on first line (size G) addressed to Germany and uprated with additional 10m adhesive pair tied by EL EBRAHIMIA/SWARDIA cds's dated 14.JA.21. A scarce envelope. H&G 2. 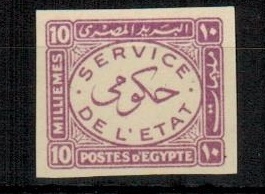 EGYPT - 1929 2m dark grey PSE to Switzerland used at CAIRO. H&G 24. 1929 2m dark grey on cream postal stationery envelope (size d) addressed to Switzerland and bearing additional 2m black adhesive tied CAIRO. H&G 24. 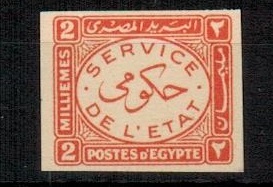 EGYPT - 1922 2m vermilion PSE to Switzerland used at CAIRO. H&G 21. 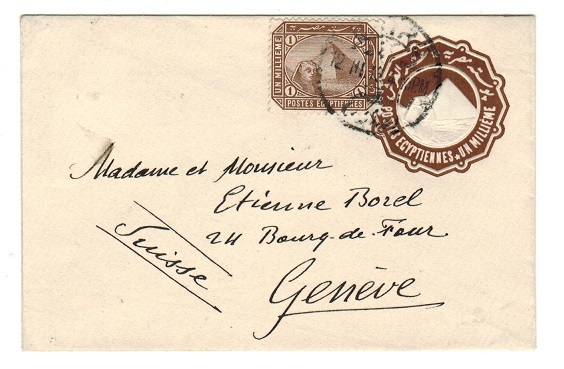 1922-25 2m vermilion on white laid paper postal stationery envelope (size d) addressed to Switzerland. H&G 21. 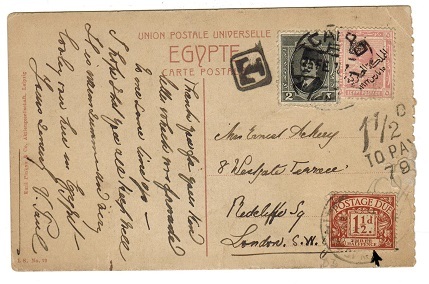 EGYPT - 1889 1m brown PSE uprated to Switzerland. H&G 4. 1889 1m brown postal stationery envelope (size d) addressed to Switzerland and bearing additional 1m brown adhesive tied by CAIRO cds dated 12.III.13. H&G 4. EGYPT - 1889 1p blue-grey PSE to Switzerland used at CAIRO. H&G 2b. 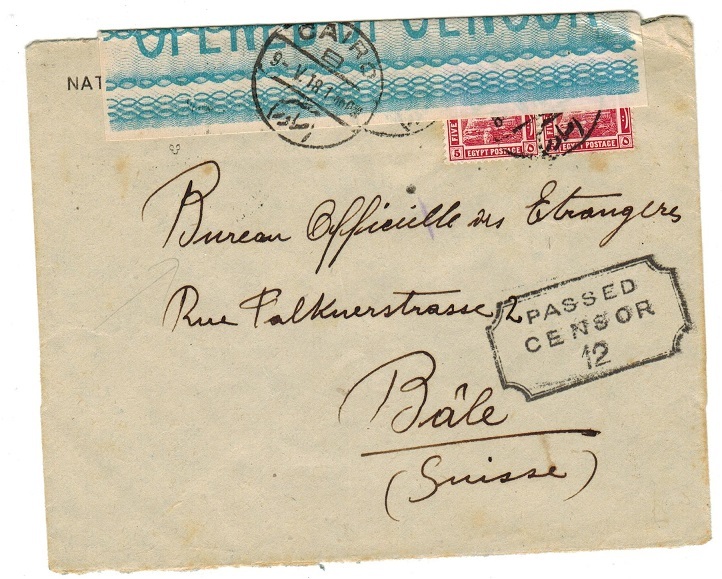 1889 1p blue-grey on bluish white postal stationery envelope (size a) addressed to Switzerland cancelled by CAIRO cds dated 4.01.07. H&G 2b. EGYPT - 1889 1p ultramarine PSE to Switzerland used at CAIRO. H&G 2a. 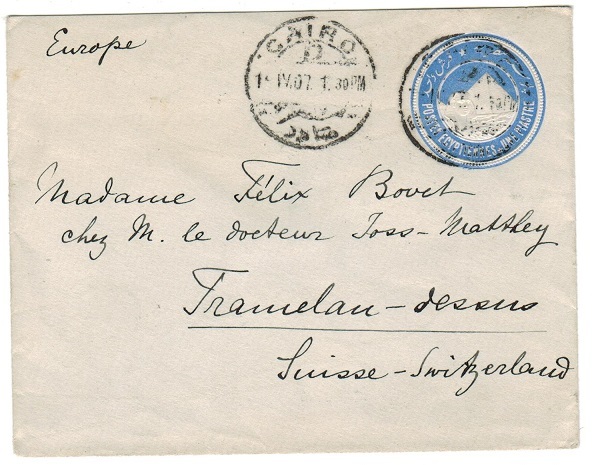 1889 1p ultramarine on bluish white postal stationery envelope (size b) addressed to Switzerland cancelled by CAIRO cds dated 1.IV.07. H&G 2a. EGYPT - 1916 censored cover to Switzerland. 1916 (NO.20.) 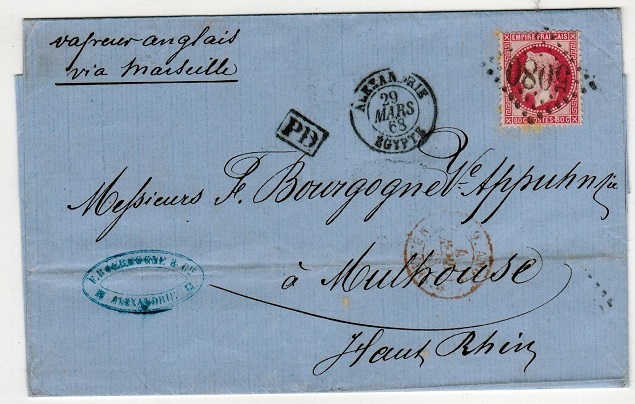 commercial cover to Switzerland bearing 5m pair tied ALEXANDRIA with blue on white OPENED BY CENSOR label on top edge tied on the front and reverse sides by red oval PASSED BY CENSOR/No.6 h/s. 1916 (22.IV.) 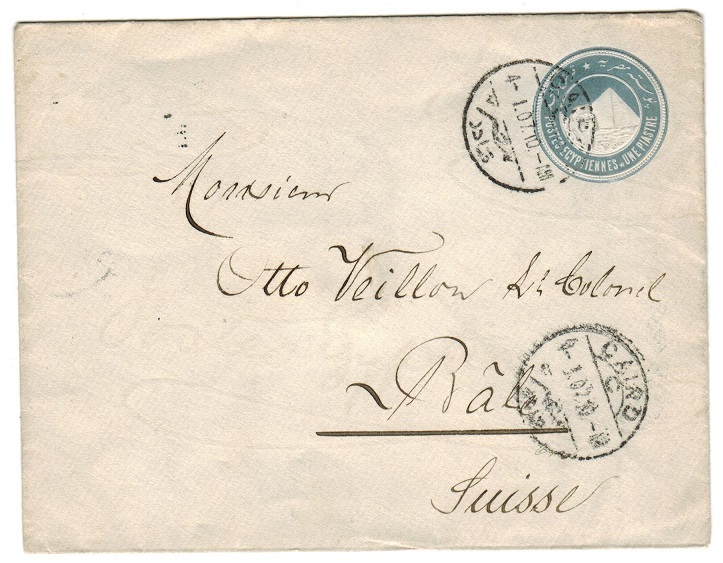 commercial cover to Switzerland bearing 5m pair tied ALEXANDRIA with blue on white OPENED BY CENSOR label on top edge tied on the front and reverse sides by violet oval PASSED BY CENSOR/No.6 h/s. 1916 (20.III.) commercial cover to Switzerland bearing 10m adhesive tied ALEXANDRIA with blue on white OPENED BY CENSOR label on top edge tied on the front and reverse sides by blue oval PASSED BY CENSOR/No.20 h/s. EGYPT - 1889 5m PSE used locally from BACOS. H&G 6. 1889 5m carmine on cream postal stationery envelope (size a) addressed locally and cancelled by BACOS cds dated 20.X.10. H&G 6. EGYPT - 1922 2m PSE used locally from ENVILLE. H&G 21. 1922 2m vermilion on cream postal stationery envelope (size d) addressed locally cancelled by ALEXANDRIA/ENVILLE cds dated 15.MR.27. H&G 21. 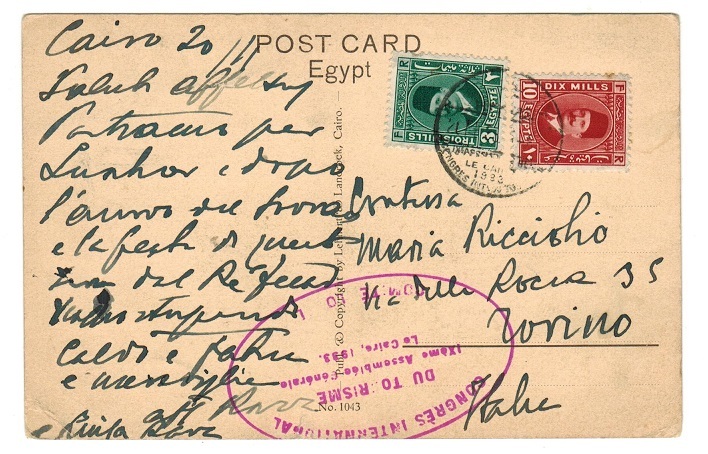 EGYPT - 1913 underpaid postcard with 'Postage Due' added. 1913 (13.Iv.) use of picture postcardaddressed to Germany depicting 'Karnak, The pylon of Euergetes' bearing 1m (x2) and 2m adhesives tied LUCSORE. 'T' tax mark applied in pencil and with 2p orange postage due added (SG D74) and cancelled the same day. 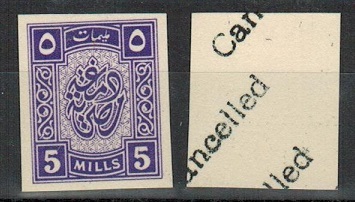 EGYPT - 1950's 5m violet IMPERFORATE PROOF 'Revenue' adhesive h/s'd CANCELLED on reverse. 1950 (circa) 5m violet REVENUE adhesive IMPERFORATE PROOF and handstamped diagonally on reverse CANCELLED. Ex King Fuad. EGYPT - 1884 2m rate local registered cover used at FOUA. 1884 registered cover addressed locally (ex reverse flap) bearing 2m orange adhesive tied by FOUA cds with a further strike at right and scarce black registration handstamp at top. (Smith Reg. No.1). EGYPT - 1915 (circa) PRINCE HUSSEIN KAMEL unused multi coloured perforated label. 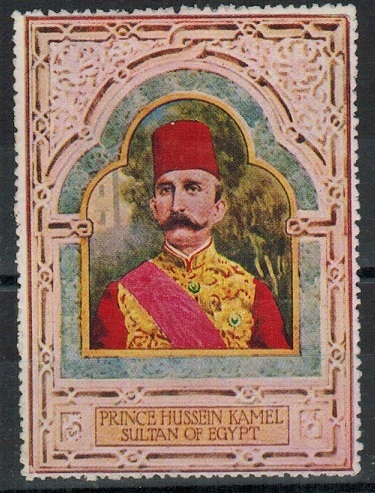 1915 (circa) multi coloured perforated label depicting PRINCE HUSSEIN KAMEL the Sultan of Egypt. Unused with out gum. 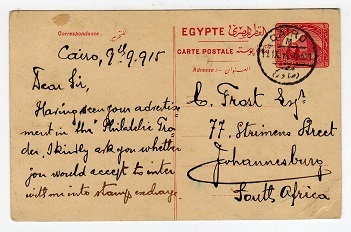 EGYPT - 1918 censor cover to Switzerland. 1918 (9.V.) 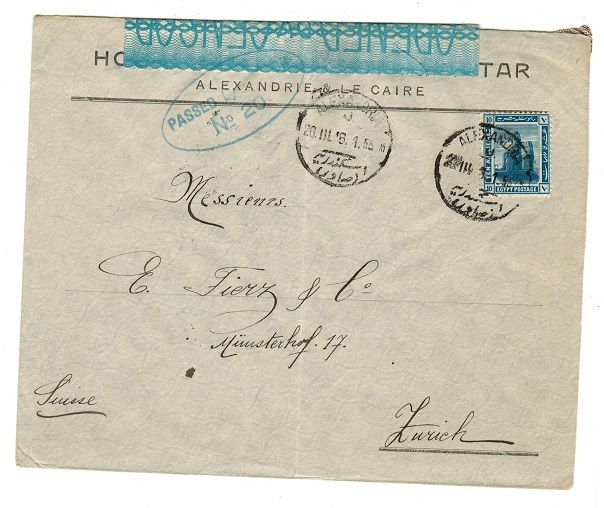 cover addressed to Switzerland bearing 5m pair tied by CAIRO/B cds with blue on white OPENED BY CENSOR label applied over the edge of the stamps at the top of the cover and with black PASSED/CENSOR/12 h/s struck below. BASEL arrival b/s. 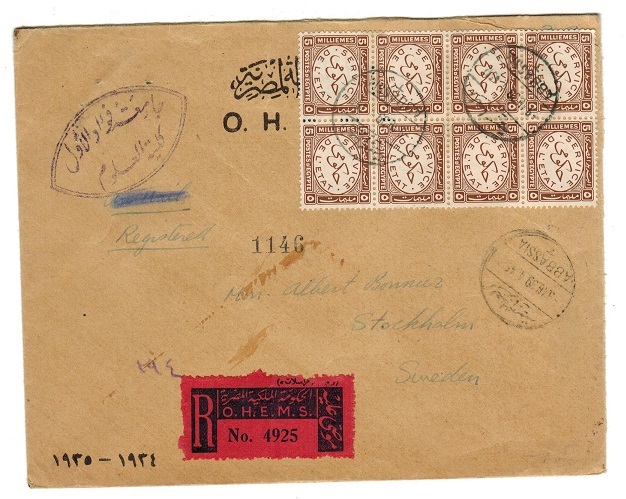 EGYPT - 1939 OHMS registered cover to Sweden with 5m official block of four used at ABBASSIA. 1939 (3.10.) use of O.H.M.S. registered cover to Sweden bearing 5m brown 'Service De L'Etat' adhesive in a fine block of eight tied by ABBASSIA cds and with black on red R.OHMS/No registered label at lower left. EGYPT - 1915 stampless censored postcard used by the Indian Expeditionary Force. 1915 (10.X.) 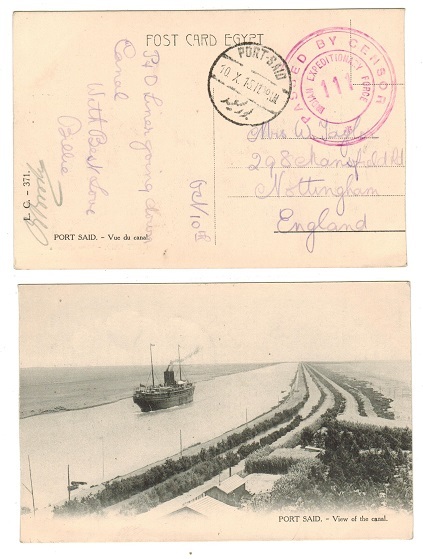 unstamped postcard addressed to UK depicting 'Port Said - View Of The Canal' struck by PORT SAID cds with large red PASSED BY CENSOR/INDIAN EXPEDITIONARY FORCE/111 h/s applied. EGYPT - 1933 postcard to Italy with 1933 CONGRES INTERNATIONAL cds and cachet. 1933 (FE.21.) use of picture postcard addressed to Italy depicting 'The Excaviated Sphinx' bearing 3m and 10m adhesives tied by special LE CAIRO/1933/CONGRES INTERNATIONAL cds and struck below by large oval CONGRES INTERNATIONAL/DU TO RISME/ 1 XEME ASSEMBLEE GENERALE/LE CAIRO 1933 cachet in magenta. EGYPT - 1936 3m green on cover to UK used at MPO/CAIRO. 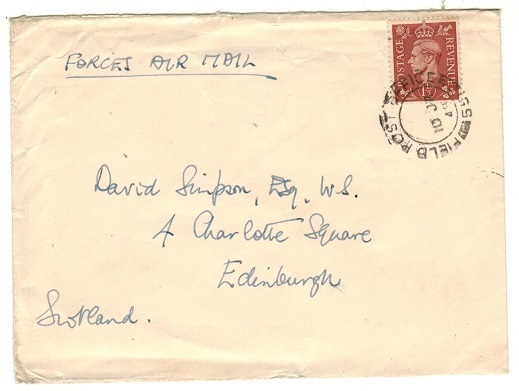 BR.FORCES USED IN - 1936 (DE.1) neat cover addressed to UK bearing 3m green (SG A12) tied by M.P.O./CAIRO cds. Scarce used on cover. (SG X100). EGYPT - 1923 locally registered cover with UNCLAMED handstamp. 1923 (JA.25) commercial cover registered locally to En Ville (slightly reduced at left from opening) bearing 15m adhesive tied ALEXANDRIA cds with black bilingual UNCLAIMED h/s applied at right. EGYPT - 1941 censored cover to UK used at EGYPT/69. 1941 (AU.3.) 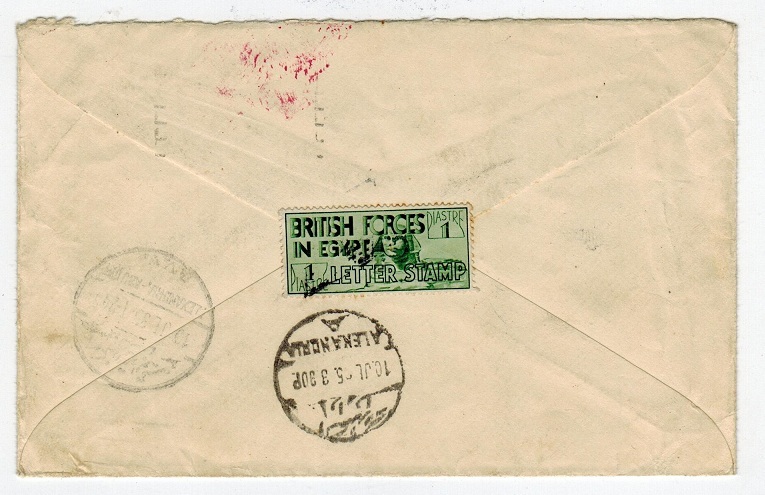 cover addressed to UK bearing 'GB' 1d and 9d adhesives tied by EGYPT/69/POSTAGE/ PREPAID cancel with violet boxed PASSED BY UNIT CENSOR 70 h/s at lower left. Mails from the Western Desert Campaign was routed through Egypt under an agreement with the Allied forces. 10d rate (4 piastres) per 10 grammes. EGYPT - 1941 censored Australian Forces 'OAS' cover to UK. 1941 (AP.4.) 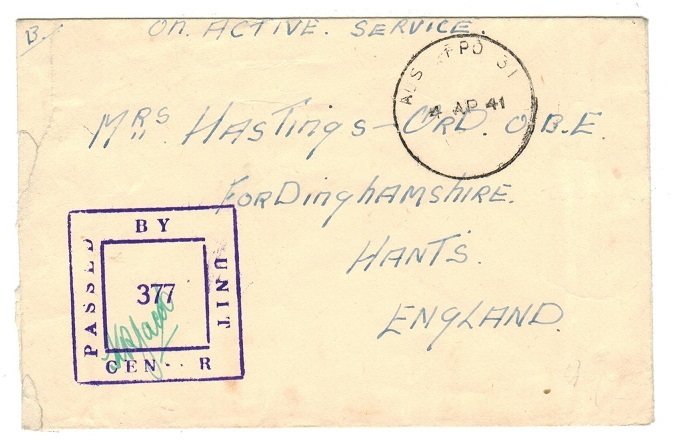 stampless cover addressed to UK marked 'On Active Service' and cancelled by AUS FPO 31 s/r cds with violet boxed PASSED BY UNIT CENSOR/377 h/s at left. This being the last day of use at Ikingi Maryut in Egypt before the Australian troops left for Tobruk. EGYPT - 1929 registered cover used at ZANKALLIN. 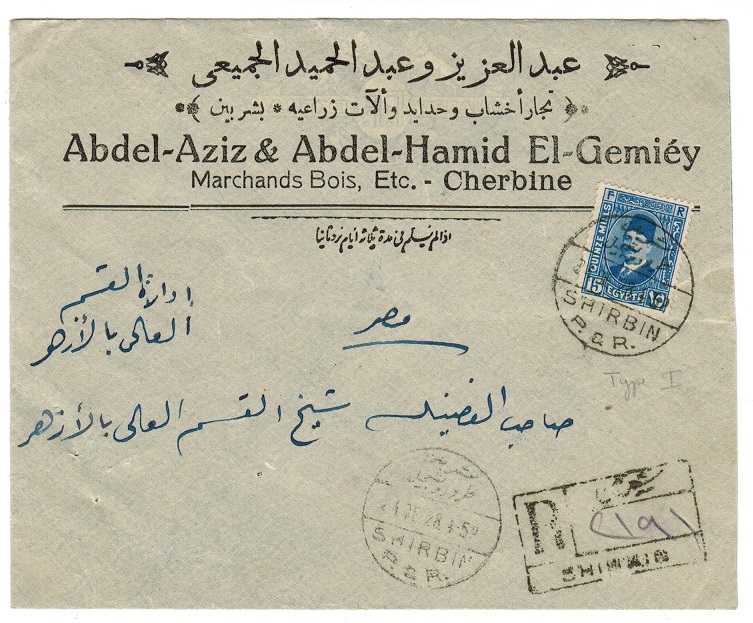 1929 (FE.2) registered cover addressed locally in Arabic bearing 5m & 10m adhesives tied ZANKALLIN with Cairo transit & AZHAR arrival b/s's. 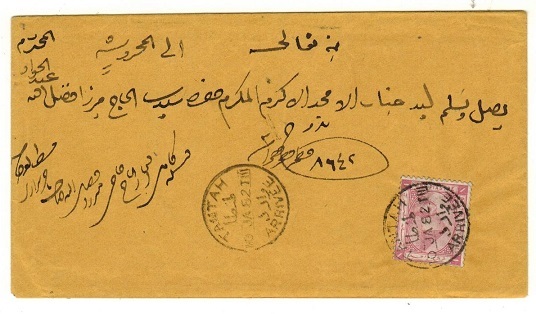 EGYPT - 1931 registered cover used at MANSHIET SULTAN. 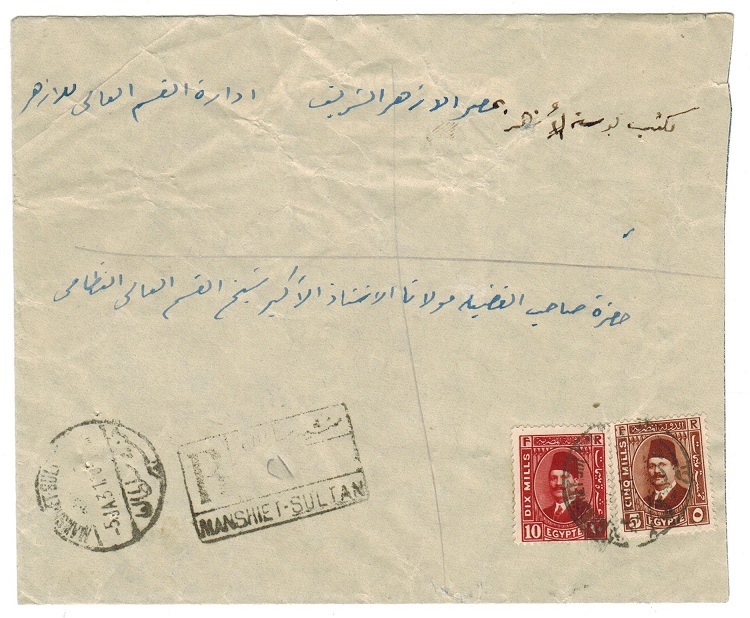 1931 (JA.5) registered cover addressed locally in Arabic bearing 5m & 10m adhesives tied MANSHIET SULTAN with AZHAR arrival b/s. 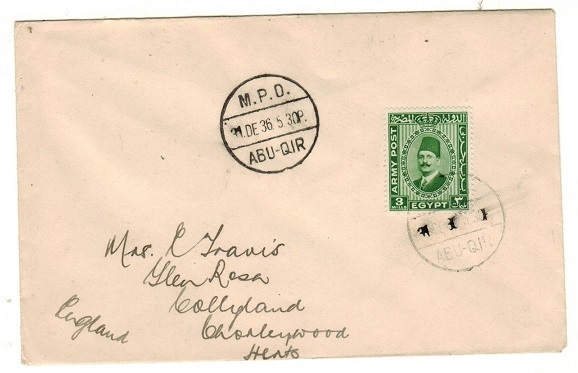 EGYPT - 1930 registered cover used at KOM EL NUR. 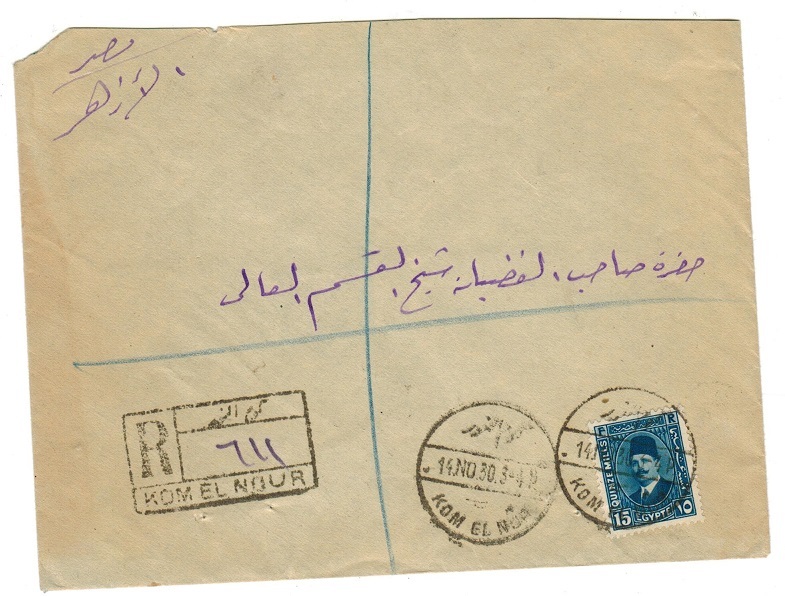 1930 (NOV.14) registered cover addressed locally in Arabic & bearing 15m adhesive KOM EL NUR with ASHAR arrival b/s. 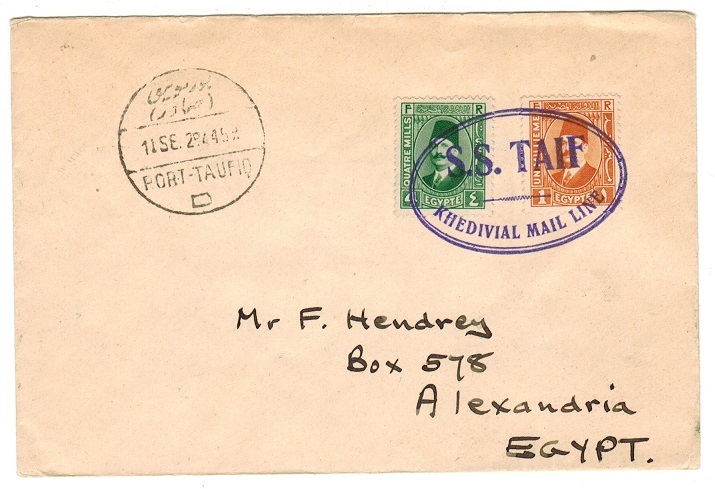 EGYPT - 1930 registered cover used at HURIN. 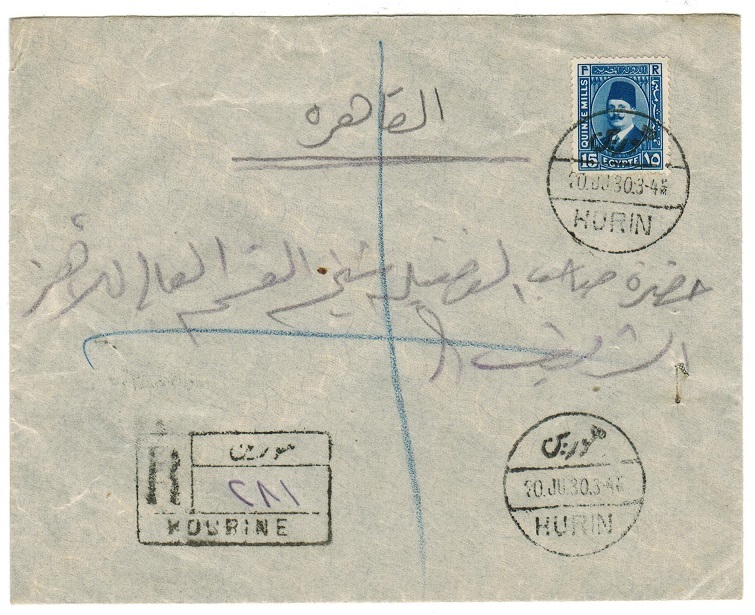 1930 (JUN.20) registered cover addressed locally in Arabic bearing 15m adhesive tied HURIN with AZHAR arrival b/s. 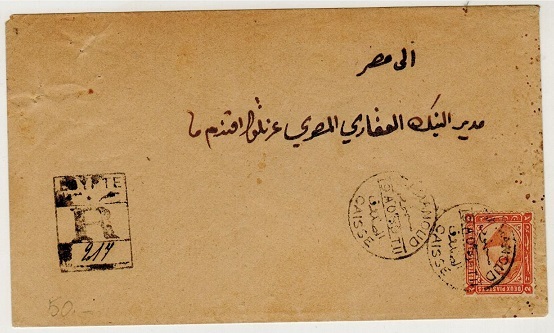 EGYPT - 1928 registered cover used at KOM-HAMADA. 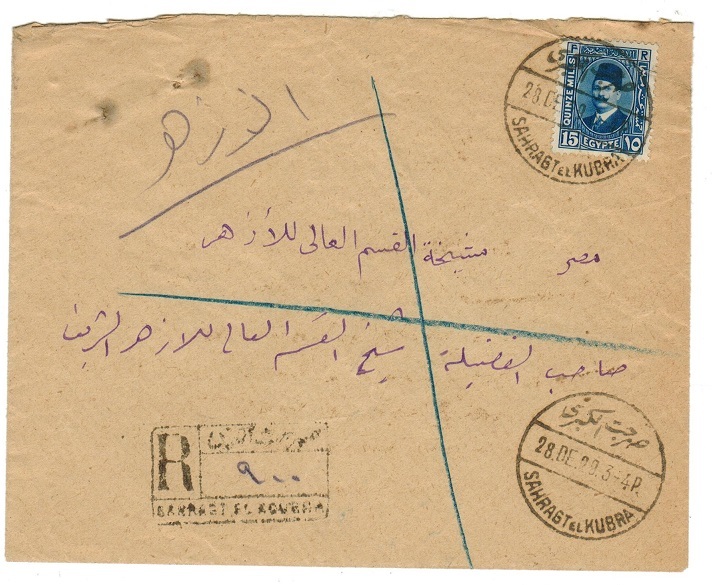 1928 (NO.20) registered cover addressed locally in Arabic bearing 15m adhesive tied by KOM- HAMADA cds with Cairo transit & AZHAR arrival b/s's. EGYPT - 1929 registered cover used at SAHRAGT EL KUBRA. 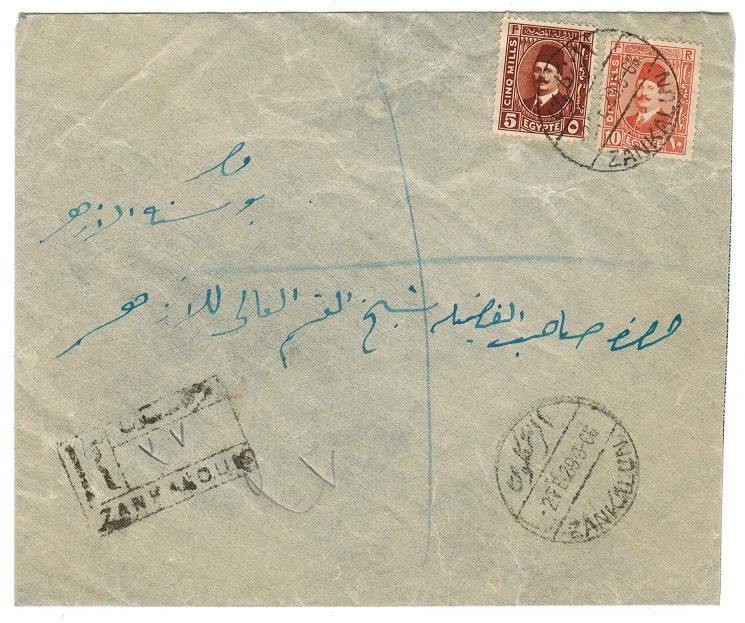 1929 (DE.28) registered cover addressed locally in Arabic bearing 15m adhesive tied by SAHRAGT EL KUBRA cds with AZHAR arrival b/s. EGYPT - 1928 registered cover used at SHIRBIN/P&R. 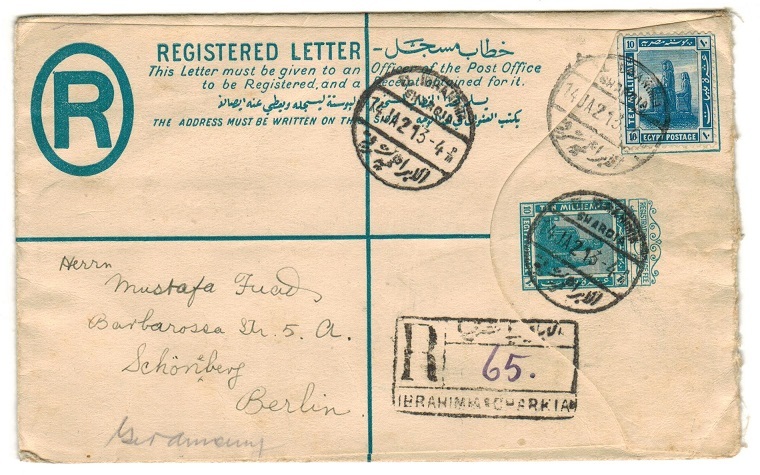 1928 (DE.24) registered cover in Arabic bearing 15m adhesive tied by SHIRBIN/P&R cds with AZHAR arrival b/s. EGYPT - 1922 underpaid picture postcard to UK from CAIRO. 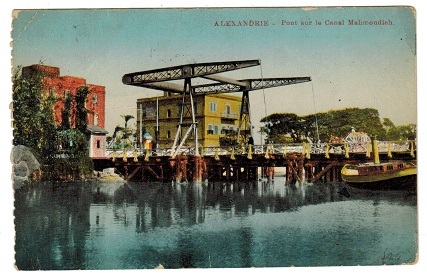 1922 underpaid postcard addressed to UK depicting 'Alexandrie-Pont Sur Le Canel Mahmoudieh' bearing 2m black with 5m 'Kingdom' overprint adhesive tied by CAIRO cds. Black boxed 'T' h/s at left and with '1 1/2d/TO PAY/79' strike applied on arrival with GB 1 1/2d postage due added. EGYPT - 1922 5m pink uprated postal stationery letter sheet used from SHEBRA. H&G 8. 1922 5m pink on white woven paper postal stationery letter sheet registered to Cairo and bearing additional 10m adhesive tied by SHEBRA (CAIRO)/R cds dated 18.AP.29. Some small opening faults and with pin hole through to fasten. A scarce piece of stationery. H&G 8. 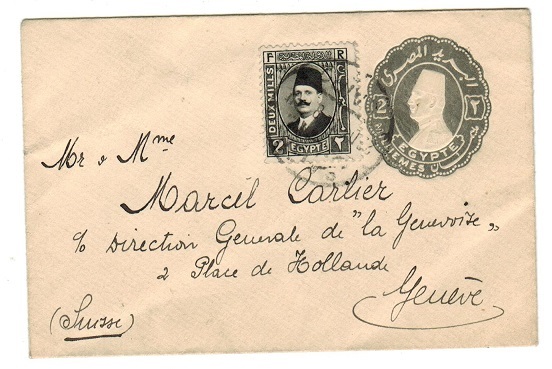 EGYPT - 1906 4m IMPERFORATE PROOF (ex Helio Vaugirard). 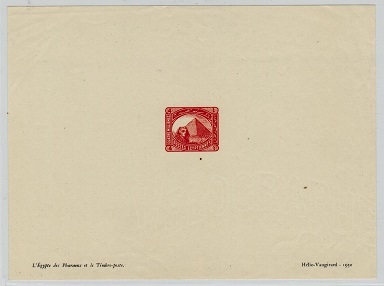 1906 4m vermilion (SG type 21) IMPERFORATE PROOF printed on thin white paper (110x 155mm) & marked at bottom 'L' Egypte Des Pharaons Et Le Timbre Poste/Helio-Vaugirard 1950'. Very few copies being in the hands of the public from this printing company. Scarce. 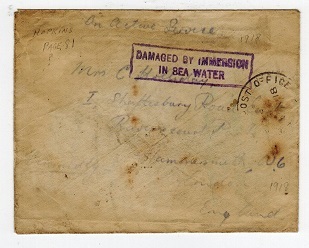 EGYPT - 1918 'OAS' soldiers envelope (ex Egyptian Expeditionary Force) DAMAGED BY SEAWATER. 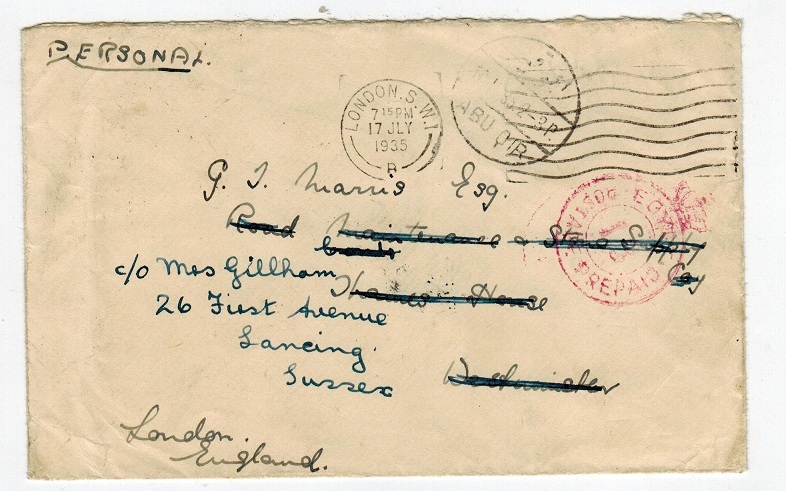 1918 use of stampless 'On Active Service' envelope addressed to UK in soldiers pen cancelled by part ARMY POST OFFICE/SZ cds and struck by violet boxed DAMAGED BY IMMERSION/IN SEA WATER handstamp. 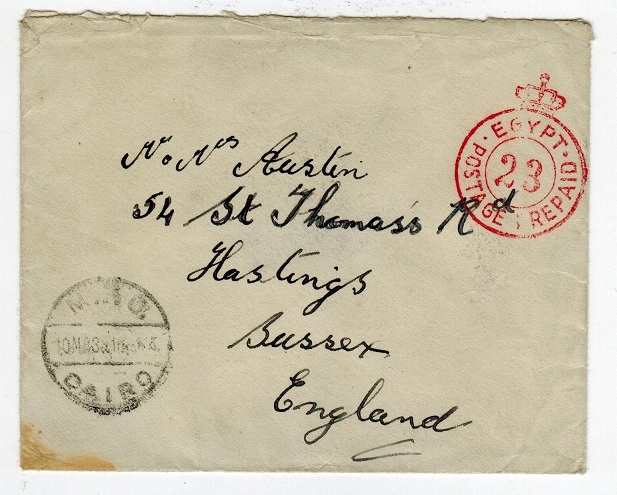 Ex S.S.Kingstonian mail from Egyptian Expeditionary Force. EGYPT - 1909 4m red PSC used from CAIRO. H&G 18. 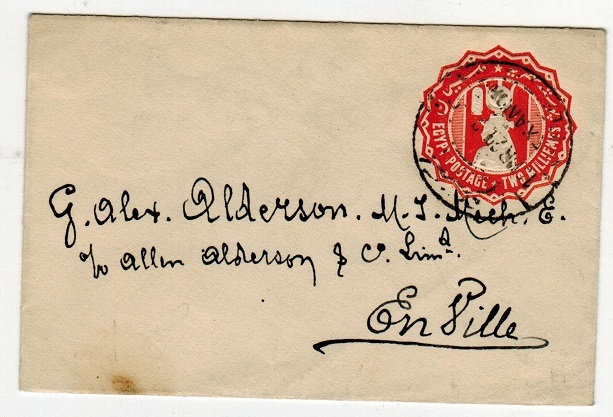 1909 4m Red on buff postal stationery postcard addressed to S Africa & cancelled CAIRO 11.IX.15. H&G18. 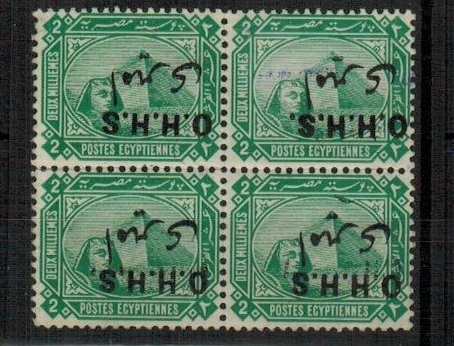 EGYPT - 1907 2m green PSC used from CAIRO. H&G 14. 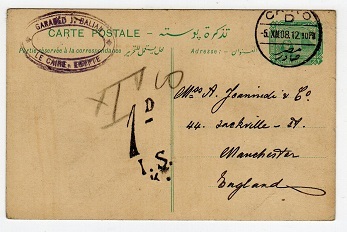 1907-10 2m Green on buff postal stationery postcard addressed to UK cancelled CAIRO/D & dated 5.XII.08. '1d/I.S./K' tax mark added on arrival. H&G14. 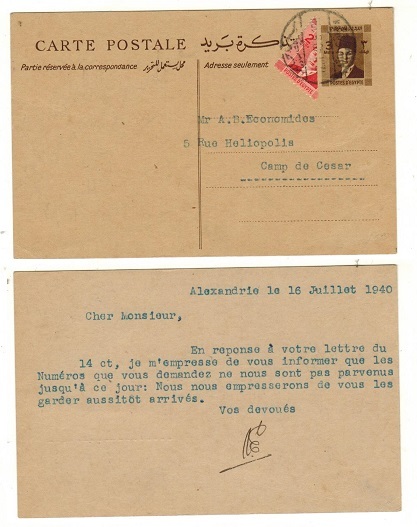 EGYPT - 1944 25m postal stationery air letter addressed to Greece. H&G 1. 1944 25m purple brown postal stationery letter sheet on unwatermarked paper addressed to Greece and cancelled by light CAIRO cds dated 30.1.53 and with two Egyptian censor marks applied to front. SG 1. 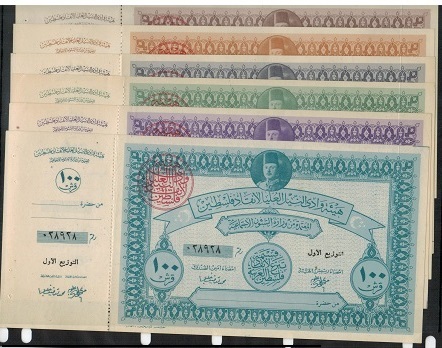 EGYPT - 1948 King Farouk range of PALESTINE AID sheets. 1948 King Farouk range of six postal order type revenue documents (240x110mm) all complete with counterfoils to receipt payment issued to raise funds for the 'Palestine Aid'. 5p in plum, 10p in dull orange, 50p in green, 50p in dull blue, 100p in purple & 100p in bright blue. All in fine unused condition. Most attractive lot. (6 items). EGYPT - 1953 5m brown-lake 'air' adhesive U/M with DOUBLE BARS variety. SG 482. 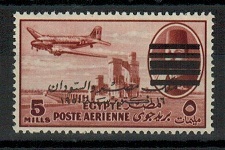 1953 5m brown-lake 'air' adhesive overprinted 'Egypt-Sudan' in unmounted mint condition and showing the variety OBLITORATOR BARS DOUBLED. SG 482. EGYPT - 1953 3m sepia 'air' adhesive U/M with DOUBLE BARS variety. SG 481. 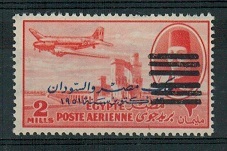 1953 2m vermilion 'air' adhesive overprinted 'Egypt-Sudan' in unmounted mint condition and showing the variety OBLITORATOR BARS DOUBLED. SG 480. 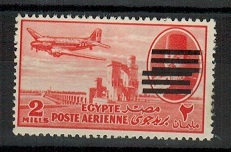 EGYPT - 1953 2m vermilion 'air' adhesive U/M with DOUBLE BARS variety. SG 480. 1953 2m vermilion 'air' adhesive in unmouinted mint condition showing the variety OBLITORATOR BARS DOUBLED. SG 455. EGYPT (Br.Forces Used In) - 1937 cover with 1p 'Letter Seal' tied in combination with 10m. BR.FORCES IN EGYPT - 1937 Coronation illustrated envelope addressed to UK bearing 1p carmine letter stamp (SG A9) tied with 10m Army Post adhesive (SG A13) by M.P.O./CAIRO cds dated 12.MA.37. An unusual combination use. EGYPT (Br.Forces Used In) - 1935 cover to UK bearing 1p 'Silver Jubilee' seal. 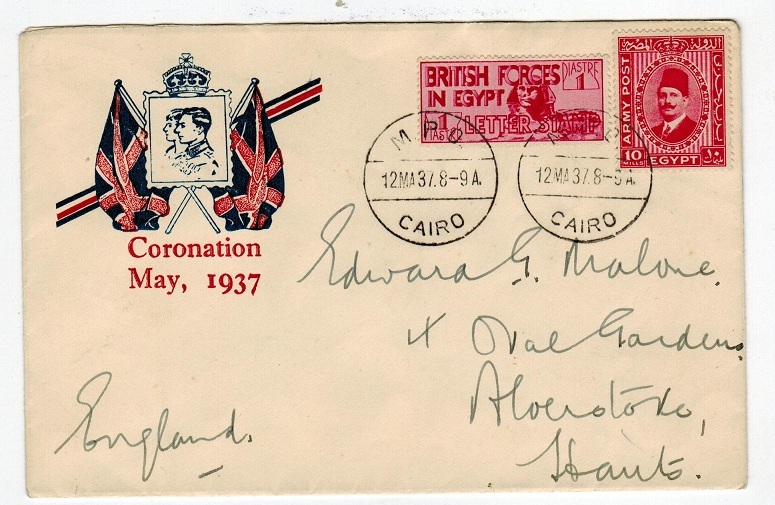 BRITISH FORCES USED IN - 1935 (MA.10) cover to UK (small stain in bottom left hand corner) h/s'd on front by red crowned EGYPT/POSTAGE PAID/23 strike & with black M.P.O./ /CAIRO cds. The reverse bears an example of the scarce 1935 'Silver Jubilee' 1p ultramarine adhesive (SG A10) cancelled by somewhat smudgy 'retta' strike. Scarce on cover. 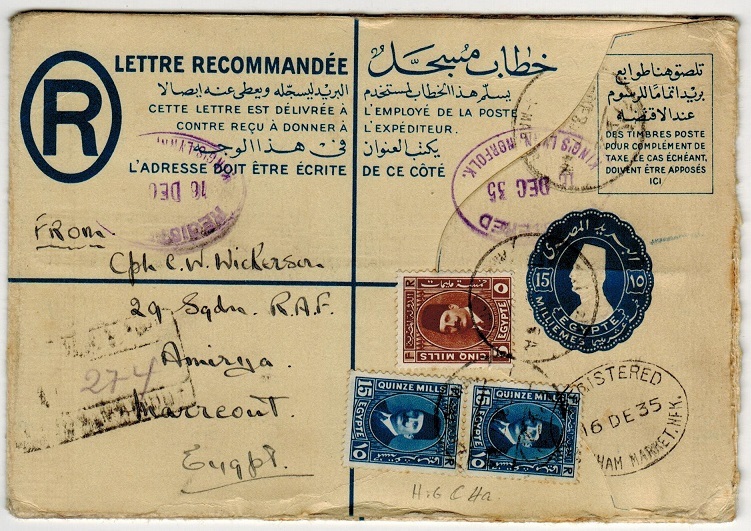 EGYPT (Br.Forces Used In) - 1935 cover to UK with 1p letter stamp used from ABU QIR. BRITISH FORCES USED IN - 1935 (JL.10.) cover addressed to UK and then redirected bearing the 1p green 'Letter Stamp' (SG A8) tied to reverse flap by light 'retta' h/s with ABU QIR cds on front and red crowned EGYPT/POSTAGE PREPAID/13 h/s. ALEXANDRIA transit b/s. EGYPT - 1913 10m blue PSE used from CAIRO. H&G 14a. 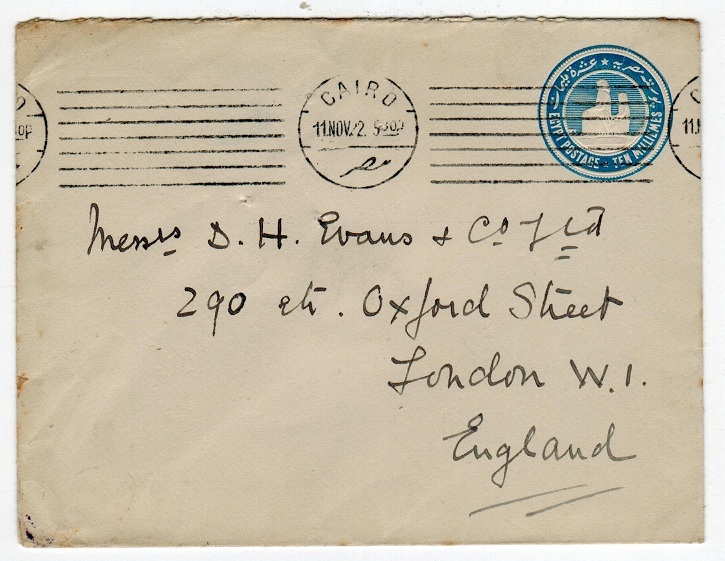 1913 10m blue on white postal stationery envelope addressed to UK & cancelled by CAIRO roller strike dated 11.NO.25. H&G 14a. EGYPT - 1889 1p ultramarine PSE used from ALEXANDRIE. H&G 2. 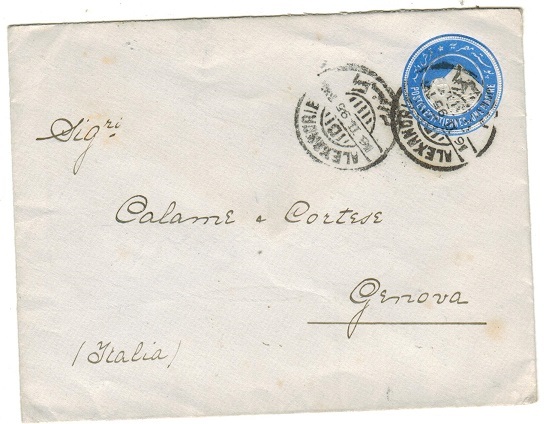 1889 1p Ultramarine on bluish grey postal stationery envelope addressed to Italy & cancelled ALEXANDER/D cds dated 17.IV.95. H&G2. EGYPT - 1942 TELEGRAPHS form unused. 1942 unused black on cream EGYPTIAN STATE/TELEGRAPHS form. 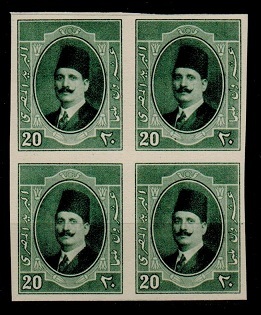 EGYPT - 1914 1m to 10m IMPERFORATE PLATE PROOF pairs. 1914 1m-10m (SG 73-77) Pictorials in very fine IMPERFORATE PLATE PROOF PAIRS without watermark. EGYPT - 1923 5m brown IMPERFORATE PLATE PROOF pair. 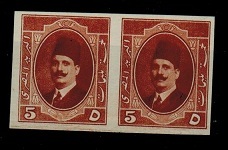 1923 5m IMPERFORATE PLATE PROOF 'King Fuad' horizontal pair (SG type 44) on gummed paper. EGYPT - 1923 20m green IMPERFORATE PLATE PROOF block of four. 1923 IMPERFORATE PLATE PROOF of the 20m (SG type 45) printed in the issued colour of deep green in a fine block of four on thick cream card. Fine & scarce. EGYPT (Br.Forces Used In) - 1932 1p IMPERFORATE PLATE PROOF of SG type A1 seal in block of 4. 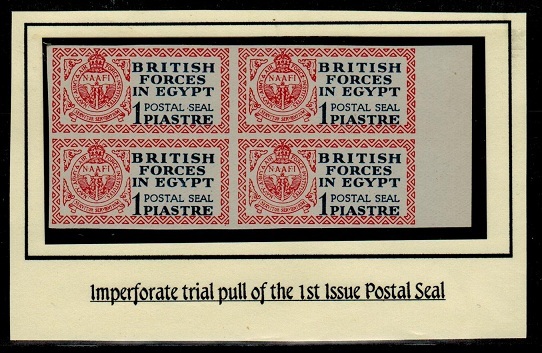 BRITISH FORCES IN EGYPT - 1932 1p deep blue on red on cream 'Postal Seal' adhesive (SG type A1) in a lovely IMPERFORATE PLATE PROOF right marginal block of four on gummed paper.